PC Sleep is a free sleep timer for Windows 8 PC. This Windows 8 Software enabled with automated functions like log off, Restart, Shutdown, Standby and Hibernate. You are almost familiar with these easy structured and user-friendly functions. 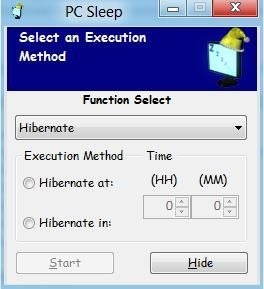 The most significant part is that you can set automated time and set your PC sleep without any extra effort. For reminder purpose, you will see a pop-up with remaining 60 seconds before the sleep time. In case, you want to stop the timer at any point of time before the PC sleeps, you can stop it by clicking the pop-up reminder before the sleep timer function executes the selected function. This utility tool is partly good for long download, where you need to see when the download finishes and you need to shut down the PC. This will help you by setting an automated timer before processing for long downloads. Now moving ahead with certain features, lets check out. Pop up remainder before executing the selected function. Enables to enter desired time of sleep. Allows to hide the program. Click on the download page. Do not miss out our featured on Best Windows 8 Software selected from the last week’s reviewed ones.